Look at your spot and see how much and what kind of sun it gets. These baskets have trouble with the intense afternoon sun. 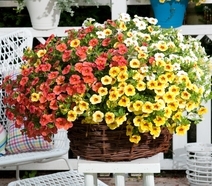 If you have baskets, taking them out of the rain will help prolong the blooms. Watering in the morning is a good idea, this allows any water on the leaves and flowers to dry off before the cooler nights. Don't let your baskets wilt; however this does not mean flood them. Sometimes wilting may indicate to much water, and death of root system. The best thing to do is push up on the bottom of the basket and see if it is light. If water comes rushing out the bottom you may be over watering your basket. Also you can stick your finger into the top of the basket and see if it is dry. 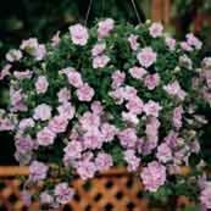 If it is light, or feels dry, add water, and fertilizer as needed--especially for petunias and million bells. When it is cloudy your basket may not need water. In fact too much water can hurt your roots as much as letting it dry out. Too much water will eventually kill your roots and your plant. This will cause your plants to look wilted because the roots are no longer taking up water. Here are some suggestions for plants that deer stay away from, however as all gardeners know there is no totally deer proof plant. *All of these plants are just suggestions from educational institutions and word of mouth. 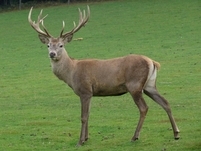 Resistance may vary based on location and deer population. First select a planter from our greenhouse, or bring your own pot or planter to the farm. Next select any color or variety of plant from our greenhouses, or have one of our experienced workers select them for you. We will plant your planter while you wait, depending on staff availability. If you want to get your hands dirty, you are welcome to use our facility to create your planter. We can come to your home if planter is immobile; call to schedule an appointment. Let our designers help you beautify your business with custom planters full of colorful flowers from our greenhouse. We can come and plant your business flowers. We can build custom beds, watering systems and planters for your business. This service is only provided at the farm location. Plant your own garden and have fresh produce right outside your door all summer. We carry over 15 varieties of Tomatoes, 12 varieties of Peppers, Zucchini, Cabbage, Onions, Melons, Cucumbers, Perennial Herbs and many more. We carry the old varieties, that are tried and true. We also have the most up to date varieties available today. All of which we trust in our own fields. All vegetables are available at the Farm and the Rt.19 locations. Stop in and let our knowledgeable staff assist you in your selection, and in getting your plants off to a healthy start. Most plants like a specific pH and fertilizer when in a container. However most public water supplies don't provide this. As a service to our customers, we provide the water with the same fertilizer and adjusted pH that we use. Just bring your own container to the farm market and fill it up. Our customers may have as many refills as wanted through out the summer. We recommend at least once a week, but fill as many times as you want. 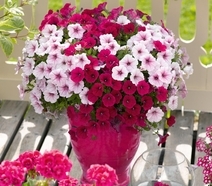 **Especially important for petunias and million-bells. Keep fertilized water out of reach of children and pets. Join our email list for new produce availability and event updates.